As a mom of three boys ranging from college to grade school, I often feel I’m not quite clicking with my boys during times of trouble or strife. My oldest son is the most similar to me in terms of personality and temperament but during rocky seasons, I just don’t seem to get the parenting thing right. I behave and speak in ways that I would have preferred from my parents when I was his age but it doesn’t seem to work. So when I had the opportunity to review “Mother & Son: The Respect Effect” by Emerson Eggerichs, PhD, I jumped at the chance. I’m eager for a tool to help be relate to my sons better and be the kind of mom they actually need. Dr. Eggerichs takes his principles of Love and Respect in marriage and applies them to the parenting realm in terms of mothers and sons. His thesis: Boys and men have a deep need to feel respected from the time they are very young. Respect is the key to their hearts. This can feel odd for a mom who wants to make sure her sons know they are loved. According to Eggerichs, respect is the way with our sons. I found Mother & Son to be sound and helpful. The author gives specific examples for a wide variety of situations for both younger and older sons. This is a section I think a reader will revisit on multiple occasions. On the con side, I struggled with Eggerichs writing style. It feels very repetitive and a bit condescending. I really had to slog through the first four chapters in order to gain momentum and glean the knowledge he laid out. I would concur with another reviewer that this book is worth the time but consider starting with Chapter 5. “Disclosure (in accordance with the FTC’s 16 CFR, Part 255: “Guides Concerning the Use of Endorsements and Testimonials in Advertising”): I did receive a sample of the product in exchange for this review and post. 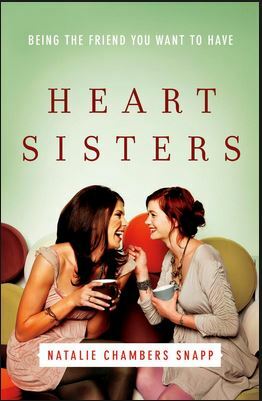 Last week I wrote a review of Natalie Snapp’s book “Heart Sisters”. You can read the review here. Today I had the hubby draw a winner for a copy of “Heart Sisters” and the winner is…. Congratulations, Rosemary. I’ll get in touch with you to send you a copy. Thanks for reading and entering. I’ll have another giveaway next month. From time to time I find myself envious of young children. Have you ever watched a group of kids at a park? They naturally gravitate to each other and play; many times names are never even exchanged! Every time I witness this phenomenon, I find myself wishing adults were more like kids. It’s hard to make friends as adults. I’ve been thinking about friendships lately. I work from home and spend a lot of time in the car in the afternoons driving the “kid taxi”. My life is pretty isolated and it’s not as easy to meet people as it once was. Throw in baggage of past hurts and I find developing new friendships to be even more complicated. It’s tempting to throw in the towel and settle in to a life of a hermit. Enter “Heart Sisters: Be the Friend You Want to Have” by Natalie Snapp. This book should be in read in every church women’s ministry and in every book club. Snapp covers every aspect of female relationships: our need for friendship, finding the courage to put yourself out there, investing in friendships, frenemies, how to recognize both healthy and unhealthy relationships and most importantly, how to be a true friend or “heart sister” to someone else. Snapp’s book is personally encouraging to me as I wade back into the social waters. She shares her own past mistakes, hurts and lessons she’s learned in the friendship arena. By sharing her personal experiences, a reader can connect more readily with what Snapp has to say. Written in a friendly, conversational tone, Heart Sisters is a definite must read for any woman wanting to develop inner heart friendships. I’m pleased to announce I have a copy of Heart Sisters to give to one lucky reader. To enter, leave a comment and tell me about your closest friend or “heart sister”. I’ll choose a winner on May 16th. I received Heart Sisters for free in exchange for a book review. I was not required to write a positive review. Eugene Cho is the founder and pastor of Quest Church in Seattle, Washington and the founder of One Day’s Wages, a “grassroots movement of people, stories, and actions to alleviate extreme global poverty”. Cho is also the author of Overrated. Cho builds a convincing case in stating many Christians (including himself) are more in love with the IDEA of changing the world than actually rolling up their sleeves and putting their intentions into action; we neglect to put ourselves in a “posture of humility” and being aware that we too must change if we want to be instruments of change. It’s easy to write about justice, to have passionate discussions about social justice, read articles, wear the t-shirt and buy the shoes all in the name of justice but Cho challenges the Church as a whole to truly understand what justice is, examine our motives and realize justice comes at a cost. The author draws heavily from his own experiences and does not hesitate to shine a light on the less-than-stellar areas of his life. Over and over again, Cho emphasizes as he sought to do justice, God sought to change him. Justice, especially within the Church, can look glamorous and cool but Cho wants the Church to remember who the justice is for, to seek out God’s will before charging ahead under our own steam, do the research before engaging in activity and to remember “we should be about the work of God”. 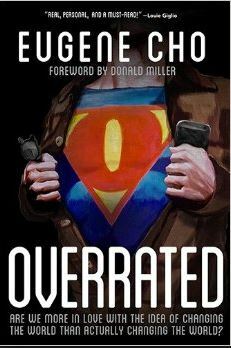 I received a copy of “Overrated” from David C. Cook Publishing in exchange for a book review. I was not required to write a positive review. Pinterest makes me feel bad. It starts off as a great way to save ideas for my son’s graduation party, books I want to read, recipes to make, but quickly it becomes a place where I am reminded I am not enough. My house isn’t in style. My skin and hair are…not good. My concrete patio isn’t stained (not a fashionable stain anyway. It does sport some spray paint, oil, and sidewalk chalk stains but I don’t think that counts). And I don’t know how to properly tie a scarf. The list goes on and on of where I don’t measure up as a woman, a mother, a wife, and just a person in general. But Pinterest isn’t the problem. Somehow and somewhere along the road of life, I’ve gotten into my head perfectionism must be, and can be, achieved if I just tried harder. But what I really am doing is chasing the proverbial carrot, alienating those around me and just wearing myself out. When I spotted an opportunity to read The Cure for the ‘Perfect’ Life by Kathi Lipp and Cheri Gregory, I jumped at the chance. Based on the cover alone, I knew this was the book I needed to read. An imperfect cupcake (or anything really) sends me into a tailspin of tears and fear of judgement. The authors spend quite a bit of time covering each of the above issues and discuss how they affect and look with different personalities. I had no problem finding myself in the text and seeing how I am affected. 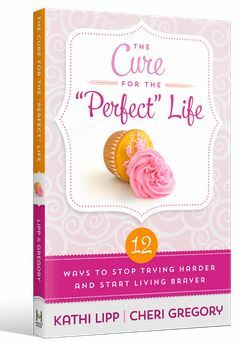 The Cure for the ‘Perfect’ Life is a Christian-based book; the authors incorporate Scripture into their work without being preachy. Lipp and Gregory gently, but consistently, steer their readers away from the lies and burdens of perfectionism and towards where our value truly lies. This is a well-written and thought out book which would be fantastic to read on your own, in a book club or in a women’s Bible study group. However, I do not recommend purchasing the Kindle version. Lipp and Gregory have several questionnaires throughout the book which were not formatted well on my Kindle (although I was reading an Advance Readers Copy on a .pdf). Formatting issues aside, purchasing the actual paper book makes the quiz-taking process easier. I received a copy of this book in exchange for a book review. I was not required to write a positive review. Other than a few guest appearances on various television shows, I was not familiar with Jim Gaffigan until a friend of mine started retweeting the comedian’s tweets which lead to watching one of his acts on Netflix. Overstatement of the year: The man is funny. I appreciate the author’s clean humor but this may be an instance where the audio book would be preferable over the actual book. I think Gaffigan’s delivery would have really brought this material home. 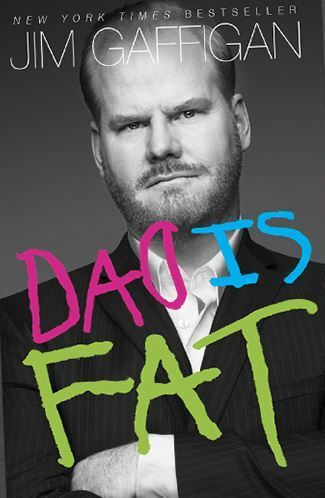 I received Dad is Fat for free in exchange for a review. I was not required to write a positive review. As I may have mentioned before on this blog, I am a Christian fiction snob. As a reader, I’m not interested in contemporary Christian romance fiction, historical Christian romance fiction, Amish fiction, Amish romance fiction, or Christian westerns. I just can’t relate. Tar and feather me if you must. So what do I like? So glad you asked! I want to read about characters and situations which feel real. If I can smell the plot points coming from a mile away, I’m not interested. If God answers every characters prayer and everyone comes to Jesus by the final chapter, I cry foul. If the characters voice changes and suddenly they sound like N. T. Wright or Dallas Willard or the author was hitting me over the head with their “message”, I’m done. I am no different from any other avid reader who wants the book they’re reading to entertain, to carry them away to another place, and allow them to escape from their own life for a moment. However, no matter the setting or the plot, the story must feel real to me. It has to be plausible on some level. Which is why I absolutely love reading Neta Jackson. If you’re familiar with Christian fiction at all, no doubt you have heard of the Yada Yada Prayer Group series. Published in 2008, Jackson wrote a great series about women in Chicago from all walks of life; married mothers, college students, single professionals, ex cons and drug addicts. Each book focused on a different character introduced in the initial book. The situations the characters dealt with are realistic and of course, being Christian fiction, Jackson also writes about faith. I lost track of Jackson’s work for quite a while and have been catching up with her House of Hope series as well as the Souled Out Sisters series. 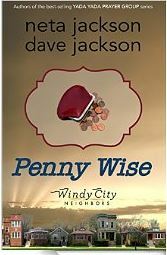 Jackson’s husband, Dave, has written a Yada Yada Brothers series and together the couple has written the Windy City Neighbors series which brings me to today’s review of Penny Wise, the third novel in the Windy City Neighbors series. I haven’t read Jackson in a while but it didn’t take much time into Penny Wise before I realized how much I missed this author. This book focuses on the Jasper family, a family of five in an urban Chicago neighborhood. Michelle is a social worker, her husband is an air traffic controller. The Jasper family deals with many modern stresses such as financial pressures, full work loads, busy family life, demanding church responsibilities, parenting teens, and trying to meet the needs of others. When Michelle finds herself in an unexpected situation, she painfully struggles with a decision she never would have considered before and wonders where God is in the midst of it all. Although I am picky and could see one plot point developing from very early on in the story, I highly recommend Penny Wise as well as Jackson’s other books. Life is messy and hard. Jackson reflects this in her work and writes about real people and a real God. I received a complimentary copy of Penny Wise in exchange for a book review. I was not required to write a positive review. As the Hooligans get older and closer to leaving the nest, my husband and I become more intent on making sure they have the tools to succeed in life and avoid the mistakes we made. Most recently, we’re focusing on money management. Both Meathead and Skippy have part-time jobs. Meathead has been working at a local grocery store for the past year. Skippy is earning money by mowing lawns and as a Little League umpire. Both boys have money burning holes in their pockets and our job is to guide them in how to save, budget, and make wise decisions. The DH (Dear Hubby) and I are pretty transparent with the kids on how we make decisions with money, where we made mistakes and what we’re focusing on moving forward. It’s our goal to help our kids avoid the traps and pitfalls when it comes to their money. 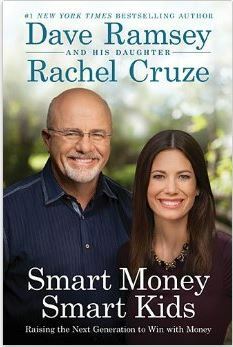 Enter Smart Money, Smart Kids by Dave Ramsey and Rachel Cruze. Dave Ramsey is pretty famous within the Christian culture for his radio show, podcasts, Financial Peace University classes taught at churches across the country, and his best-selling books such as The Total Money Makeover, Dave Ramsey’s Complete Guide to Money, and EntreLeadership. Smart Money, Smart Kids was co-written with his adult daughter, Rachel Cruze. Ramsey and Cruze take turns within each chapter speaking to the reader about a variety of money topics, starting with the Ramsey family’s personal history from wealth to bankruptcy and back again. Smart Money is written in a conversational, no-nonsense tone one would expect from Dave Ramsey and covers just about every topic one could imagine when teaching children about money. Ramsey and Cruze extol the virtues of work while teaching the dangers of debt. This book is jam-packed with advice about allowance (referred to as consignments) for children, employment, saving for purchases both small and large, college planning and even weddings. Smart Money, Smart Kids is a great, useable book for all parents, no matter the age of your children. I received Smart Money, Smart Kids in exchange for a book review. I was not required to write a positive review. I decided to read Spiritual Misfit by Michelle DeRusha based solely on the cover. The solitary red bird and the cluster of black birds spoke to me and made this a book I absolutely had to read. I can claim the mantle of Christianity but so many times I feel like everyone else gets it and I just don’t. DeRusha is a blogger and first time author who embodies the qualities I like best in memoir writing: she’s honest and relatable. 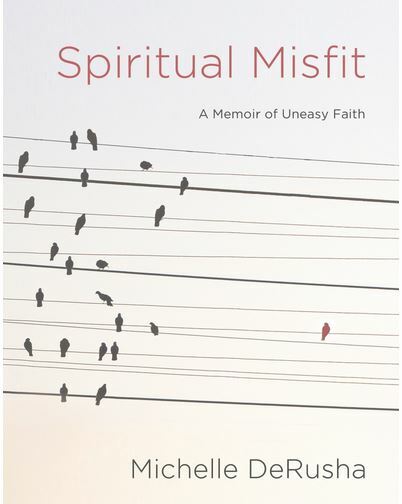 Spiritual Misfit is about DeRusha’s faith journey from a childhood faith, estrangement from belief and from God, and the spiritual questions which seemed like boulders on her journey. Reading Spiritual Misfit feels like the conversations you have with that one REALLY good friend. You know the kind of conversations I’m referring to and what kind of friend I mean; the kind of friend you can admit bad parenting days to…the really bad ones…like when I got so frustrated at my son’s incessant whining that I threatened to flush a cherished toy down the toilet. I can’t share with all my friends…just a couple of close ones. The author treats the reader as though they are THAT kind of friend. DeRusha takes the reader on her journey of faith to unbelief and back again and never once gives her audience the impression that faith is easy or that the answers were easy to find. 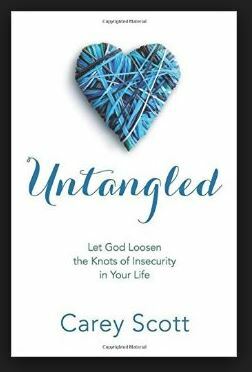 She writes of her questions about prayer, control, fear, searching for a church, imperfect “panicky” prayers, shedding the one-size-fits-all faith and embracing the beloved misfit. Spiritual Misfit is a great memoir to read on your own or even better, in a group context. It’s my hope to host an online book club to discuss Spiritual Misfit. If you’re interested, please click here and send me an email. I received Spiritual Misfit in exchange for a review. I was not required to write a positive review.